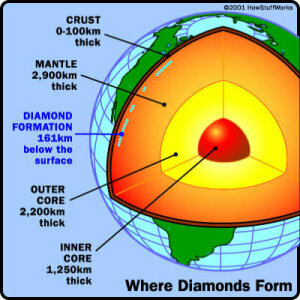 •Diamonds are made entirely of highly-compressed carbon 90 to 120 miles below the surface of the earth. •The carbon atoms form in a unique way that makes a diamond the hardest natural substance on earth. A diamond's value is based upon four characteristics: color, cut, clarity and carat weight, often referred to as the "Four C's". Each characteristic is analyzed and measured to determine the quality of the diamond. A description of each characteristic is provided below. Color is measured on a scale from colorless to shades of color with colorless being the rarest and most expensive. The Gemological Institute of America (GIA) uses a color grading scale of D-Z, colorless to shades of color respectively. As mentioned above diamonds come in different colors and anything outside this color scale are referred to as "Fancy Colors". The rarest and most expensive diamonds are considered Fancy Colors which include red, pink, blue, and green. •I1 - I3 Included - inclusions such as large crystals or large feathers viewed without magnification and may affect the transparency and brilliance. Carat weight (ct.) is the unit of measurement to weigh a diamond. One carat equals 1/142nd of an ounce, or 1/5th of a gram (0.200 gram). Diamonds are weighed into a thousandth of a carat(0.001) and then rounded to the nearest hundredth. Diamond sizes are also referred to as "Points". One carat is divided into 100 points, each point is 1/100th of a carat. A "10-point" diamond weighs 1/10th of a carat and a 50-point stone weighs half a carat. It is important to note that diamond gradings between the different gemological laboratories are not always consistent. Since the grading of color and clarity is based upon subjective judgment, different grades can be given to diamonds that are borderline between two grades.